Your precious little baby will love this soft and cuddly Personalized Baby Blanket. Nap time is sure to be welcomed by your little one with this warm and comfortable Personalized Baby Fleece Blanket. Give this baby blanket as a heartwarming Baby Shower gift for the Mom to be. 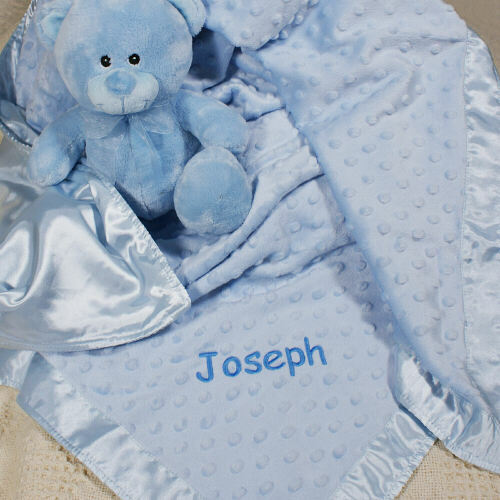 Our Embroidered Baby Fleece Blanket is 100% polyester and is machine washable. Baby Blanket measures 38" x 29". Includes FREE Embroidery! Personalize your Personalized Baby Blanket with any name. ( ie. Joseph / Blue ) Plush Bear is not included. Baby Blanket measures 38" x 29"
Loved this! This is the best site to personalize something! This is the 6th time I'm ordering the same blanket for a different baby. It's the perfect baby gift. Browse through all of our soft and cuddly gifts to find a great personalized baby blanket for your newborn!